This week I’m still digesting the mega online Indie publishing conference Indie ReCon. I still haven’t caught up with all of the online content, but I’m happy it will stay there for a while. There is so much juicy information there. A big cheer to the behind the scenes team for putting it all together. More than 25,000 people dropped into Indie ReCon last year. I would say that was surpassed this year, hugely! Porter Anderson, spent some time at the London Book Fair and dropped into The Indie ReCon meet-up at Foyles in London. Two interesting developments have caught the eye of The Passive Guy this week. The rise of digital reading in China, over 50% of adults are reading online. And a new bookselling venture in Florida. This one caught my attention as it seems to be taking the showroom bookstore model and tweaking it for Indie Authors. There are lots of comments about how successful this model might be. I am seeing more Indie authors grouping together to share resources and publish collectively. I’ve been saying this is the way to go for years - this bookstore selling model seems to take it all a step further. Authors rarely talk about the hazards of their profession but with J K Rowling tweeting this morning about writers back... (too long sitting in one position,) attention is back on stand-up writing desks. Michael Hyatt blogged about his desk this week and then Nicola Morgan decided to share how she improved her health dramatically in the last month. I’m eyeing up my desk... if I can get to it. It seems to be the repository of the families clutter. Author websites have been the focus of Joanna Penn’s blog this week. This is an ultra comprehensive post on the subject. You will find yourself coming back again to it. Don’t get overwhelmed as she says... small tweaks. Joanna has also interviewed Tim Grahl about book titles, productivity, marketing and other stuff. It’s a wide ranging interview and full of tips. Last week I linked to Delilah Dawson’s plea about Self Promotion and Social Media. This week staying with this topic Rachel Thompson gives some tips to deal with this stress and not become a spam monster. All about Pacing. This is a great post on that tricky craft subject. Picking the right editor for each stage of writing. I’m off to re-jig the Tinderbox2015 timetable, again, and play around with my writing desk. 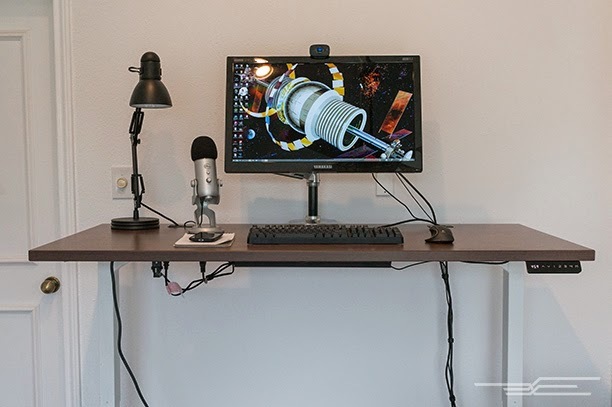 Pic is from a review of Standing Desks… this one goes up and down at the push of a button.